Before I show you how I made my NG30 panels, it is important to reiterate that I am applying the extended round nose mod. This means the NG30 templates are different than the original plans. You can see my version of the NG30 templates here: NG30 extended. The modified NG30 panels are highlighted in orange below. The nose gear strut and electric actuator attach to these panels - making the "nose box". I started out by making a template of the NG30 profile out of paper and cutting 24 BID plies at 45 degree bias. The original plans calls for 16 plies (orientation optional). I decided to add 2 plies per surface (2 NG30s, each panel has a front and back... so instead of 4 plies per surface I did 6). This is to help reinforce the NG30s as some builders have experienced cracks due to hard landings. Using high density foam board (H250), I cut out the two NG30 panels. The Ying and the Yang! I then fine tuned the outline by sanding one panel to final shape. I then clamped the "perfected" panel on the bottom of the other and used my router to trim the un-perfected panel to a perfect copy. I stopped halfway through the trim to show how the router does a beautiful job at trimming the top panel to a perfect flush trim with the lower panel (the right side of the picture is trimmed, and the left side of the picture is still untrimmed) using a roller bit. Taaaa-daaaaaa!!! Perfect mirror images of each other! And my lovely assistant Elle began the 6 ply layup (remember, the plans calls for 4, but I added 2). Notice how the roller rides along the foam's edge and cuts the fiberglass on the bottom - giving a beautiful nice flush finish! Taaaaa-daaaaaa! Inside layup complete and trimmed! It was now time to flip the NG30 panel over and mark the necessary NG51 bracket attach support holes. I should note that the original plans NG51 brackets are different than the ones shown here - that's because I am planning on installing an electric retract system (as apposed to the original plans manual retract system). The electric system comes with modified NG51 brackets used to mount the actuator onto the NG30 panels. Since Jack Wilhelmson (the designer of the EZ-nose-lift retract system) built it to be used as a retrofit or as a new installation (if building the airplane for the first time), the brackets use the same holes called out in the original plans. Using the plans, I measured the horizontal and vertical distances from the F-22 mating edge to the center of each hole. As for the orientation of the NG51 bracket, I aligned the bottom hole of the bracket (which comes pre-drilled) and coincided it with the corresponding punch mark I made on the foam. I then rotated the bracket about this punch mark to obtain the correct spacing between the other two punch marks and the edge of the bracket. Jack W's installation plans states that the distance between the edge of the bracket to the center of the punch mark should be equal to or greater than 3/8". 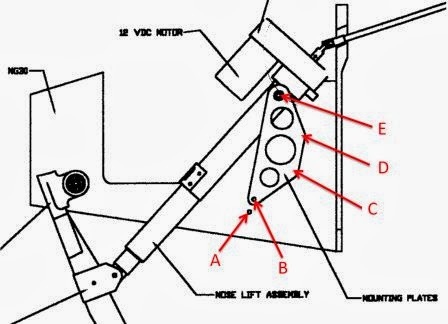 A special note about the "existing holes"... just to be clear, the EZ-nose lift system does NOT use the lower most hole (indicated as hole 'A' in the drawing below). Holes 'B', 'C', and 'D' do get used on BOTH sides. The original plans has us omit hole 'C' on the right side, but since it IS used for the modified NG51 brackets, it is important to add the 15-ply reinforcement on here as well. Also, since I am applying the extended round nose mod, my NG30's are bigger and taller. This causes 'E' to be in the way of NG30. I will make a 1" diameter cutout in this location to make proper clearance of the bolt heads used to attach the actuator to the modified NG51 brackets. If using the original NG30 design, 'E' would be above NG30 and this 1" hole cutout would not be required. With all the holes marked, it was time to make the pilot holes. After making all the holes on one NG30, I clamped the other panel to it and used it as a drill guide. With the pilot holes complete, it was time to remove the foam to make room for the 15 plies of reinforcement. Handy router back to the rescue! Looks like crop circles! I adjusted the bit height so that it would just barely touch the fiberglass on the other side. Let's not forget the large 2.8" dia front pivot circle! High-density foam is not so easy to sand... and I quickly got tired of using manual labor to round the edges of all the holes - so dremel to the rescue! It is VERY important to sand the surface until it is obvious ALL the foam has been removed and that the fiberglass is sanded dull - this assures a good bond will be made with the 15 plies of reinforcement that will go on top of it. I also sanded the 45 degree edges nice and smooth. Ok, we are now ready for the 15-plies of reinforcement in each hole... plus the 6 plies of BID over the entire surface area. The 15 plies of reinforcement could be prepregged and cut while it is still wet; however, with the plies being so small, I feared they would get all messed up while trying to cut through 15 plies of wet fiberglass. So I decided to cut all my plies dry and wet them in place. Also, cutting them ahead of time allowed me to increase the size of the cloth like an upside down wedding cake. I divided the 15-plies into 3 sizes (small, medium and large). So I cut 5 small, 5 medium and 5 large circles times 6 (since there are 6 holes)... that's a lot of cutting! Oh yea, let's not forget the front pivot hole as well. It took me about an hour or so to cut all these circles. Notice the small, medium, and large sizes. I then dipped my finger into the epoxy cup, and poked a fiberglass circle, causing it to stick to my finger and picking it up. I then poked it into the crater and spread the epoxy around until it was completely wetted out. I did 5 layers of the small... followed by 5 layers of medium and then 5 layers of large. Crater has been filled with 15 plies! The black outline is the sharpie ink of when I traced the circles earlier. I then placed the first layer of BID over the entire surface... and continued to apply all 6 plies. After applying each layer, I poked the craters to make sure no air bubbles laid underneath. Same process as before with the router table... notice the roller riding along the edge and cutting the fiberglass to a nice flush edge. Taaaa-daaaaaa!!! Two NG30's ready for a nose gear box assembly! I've been watching your build for some time now and it's the tiny details and smart ideas i'm coming back for. Even thou I'm building some completly different breed of bird some things can be learned from your blog. One question still remains: Why don't you use peel ply to prepare bonding areas? Could it tangle up in the router? I do agree that peel ply is good for prepping bonding surfaces, but for some areas, I find it easier to sand it with a hand held electric sander after cure. Peel ply loves to leave a bunch of annoying strands behind which I end up having to sand anyway to get rid of them. So if it's just a few strips, I don't bother with the peel ply and simply sand it after cure. The router is a strong beast! It will cut through anything. I never tried cutting cured fiberglass with peel ply still attached - but I don't think it would get tangled up. You do have to be careful to make sure you have enough cured overhang though - else plain fiberglass cloth (without any epoxy) will get tangled. I had this happen to me once and it scared the crap out of me! Luckily, I hit the e-stop button before any damage was done. I learned my lesson though and I make sure I wet out at least 0.25" past the edges. You said you are building a completely different breed of bird? What kind? Feel free to email me at thelongezbuild (at) gmail (dot) com. Have you ever thought about going parts for other people to find your project? You seem to be quite good at the building process. Have you thought about building parts for other people to find your project? You seem to be quite good in the building process. Thanks Todd! If it were cost effective and I could earn a living out of it, I would do it in a heartbeat! The problem is it takes up a lot of time. Cost of materials is not cheap either. So it would not really be worth my time and effort for what I could earn selling these parts. That said, if you meet a rich guy willing to pay me top dollar to build an airplane from scratch, please let me know!